Attracting wild life and birds in particular is achieved by providing food, water and safety. 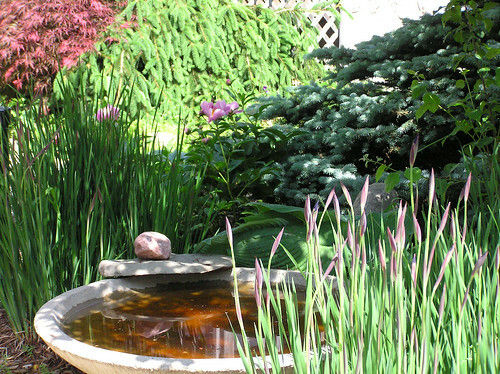 Your bird-bath has provided the central issue, water, and your plants can help in the other two areas. There is no need to sacrifice colour or the ability to grow flowers for cutting if you choose wisely. Vebascum bombyciferum the Mullein has yellow floral spires on grey green foliage and lots of seeds later in the year. Lamb’s Ears or Stachys byzantiana have mauve flowers with hairy grey leaves. Yarrow is easy to grow and Achillea Moonshine is the lacy leaved variety I would go for to add to the grey leaved scheme. Grass is popular with birds and Fountain Grass ‘Pennisetium alopecuroides’ produces late summer floral spikes and winter seeds. White flowering Rosa Nevada has pale green foliage and the Foxtail Lily Eremurus stenophyllus has white racemes. Birds will be attracted by insects who visit flowers like Thyme, Sedum, Sweet Rocket (also called Hesperis matronalis) and Heather. Background plants can overwinter insects in Virginia creeper and Ivy and also provide nesting sites. A mixed hedges provide a place of sanctuary. See also Gardening for Birds on Gardeners Tips or Trees and Shrubs for Birds. Purchase a good mix of plants of varying heights including some low lying creepers for the edges. Photo Credit normanack flickr creative commons.